Harvard University Press, 9780674545496, 288pp. Today, politicians and intellectuals warn that we face a crisis of civility and a veritable war of words polluting our public sphere. In liberal democracies committed to tolerating diversity as well as active, often heated disagreement, the loss of this conversational virtue appears critical. But is civility really a virtue? Or is it, as critics claim, a covert demand for conformity that silences dissent? 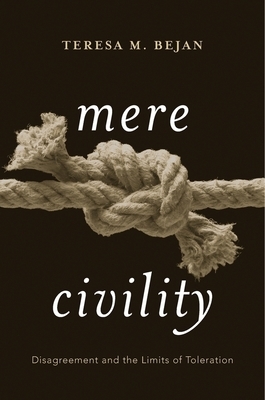 Mere Civility sheds light on our predicament and the impasse between "civilitarians" and their opponents by examining early modern debates about religious toleration. As concerns about uncivil disagreement achieved new prominence after the Reformation, seventeenth-century figures as different as Roger Williams, Thomas Hobbes, and John Locke could agree that some restraint on the war of words would be necessary. But they recognized that the prosecution of incivility was often difficult to distinguish from persecution. In their efforts to reconcile diversity with disagreement, they developed competing conceptions of civility as the social bond of tolerant societies that still resonate. Most modern appeals to civility follow either Hobbes or Locke by proposing to suppress disagreement or exclude persons and positions deemed "uncivil" for the sake of social concord. Compared with his contemporaries' more robust ideals, Williams's unabashedly mere civility--a minimal, occasionally contemptuous adherence to culturally contingent rules of respectful behavior--is easily overlooked. Yet Teresa Bejan argues that Williams offers a promising path forward in confronting our own crisis of civility, one that fundamentally challenges our assumptions about what a tolerant--and civil--society should look like.